A breakout is a significant change in price direction. The classic definition of a breakout is price penetrating a support/resistance line (including triangles, flags, and pennants), but breakout can be defined in fancier ways, such as breaking a Bollinger Band, ATR band or linear regression channel, or by special bars like the engulfing bullish candlestick and key reversal bar. A breakout is usually a big one-time move in the opposite direction of the existing trend, although sometimes a breakout sneaks up on the critical level and slides over it instead of breaking it with any violence. Just about every trader watches for breakouts with an eagle eye, even long-term position traders. As a rule, the earlier you jump on a breakout trade, the bigger the gain. The problem is that many breakouts in Forex are false – they fizzle out and the price resumes in the pre-breakout direction. This is not hard to understand. The breakout occurs in the first place because of a change in sentiment toward the currency. Please see the example chart below. The breakout is characterized by a very tall candlestick that breaks upside resistance, and is followed by a few more mostly higher highs. However, the new sentiment lacks staying power, and after an upward correction (which reaches a little more than 61.8% of the previous downmove, by the way), the currency reverses. When the price penetrates the breakout point on the downside, you know the breakout has failed. The price goes on to a lower low. Traders had a change of heart about the newly positive sentiment that triggered the upside breakout. 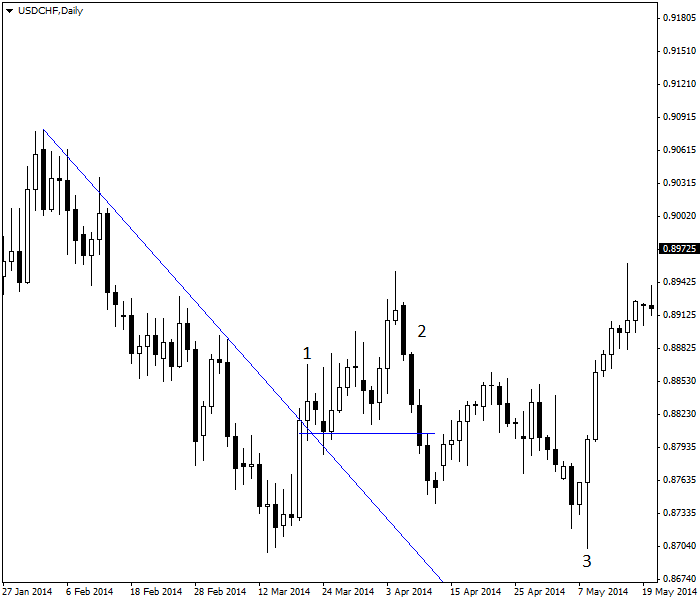 USD/CHF breaks through resistance (1), fails to establish a trend (2), proceeds to a new lower low (3). Note that sentiment changes often. A few months later, after the new lowest low, they got that positive sentiment back and staged another upside breakout. You can see it on the next chart. So far, the second breakout has not failed. It is a curiosity that the resistance lines appear to be parallel. This is a frequent occurrence and probably reflects that each currency has its own momentum habits. This particular currency pair is USD/CHF. Support and resistance lines in another currency pair, say USD/CAD, have a different slope. Breakouts are often caused by an important piece of news or an event that changes sentiment, like a central bank interest rate hike when no change was expected. 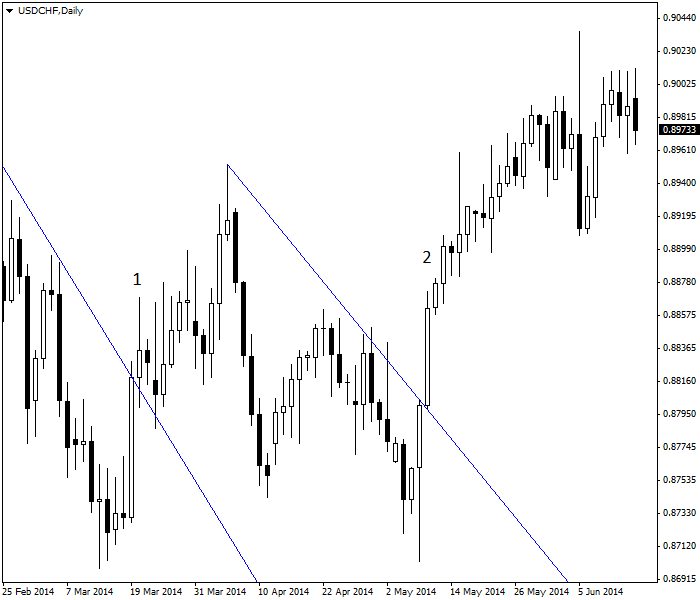 The next chart depicts NZD/USD in June 2014. The consensus of analysts was “no rate hike,” and yet for five days before the central bank policy meeting, traders were buying the NZD. We can consider it a “just in case” positioning. The NZD closed above the resistance line on the first day. It also put in a very big gain on the day of the announcement itself. This was a classic battle between analysts and traders. Traders wanted to be positioned long in case the Reserve Bank surprised with a rate hike, and this time it paid off. It should go without saying that trading against the consensus does not always work out, and indeed, this move is not completed yet. As of the data on this chart, we still do not know whether the NZD will continue upward. The breakout looks impressive, retracing about 75% of the previous downmove, but it may yet fizzle out. Active traders do not care — as the last bar shows, those who bet on the rate hike are taking profit, stalling the upmove for the moment. 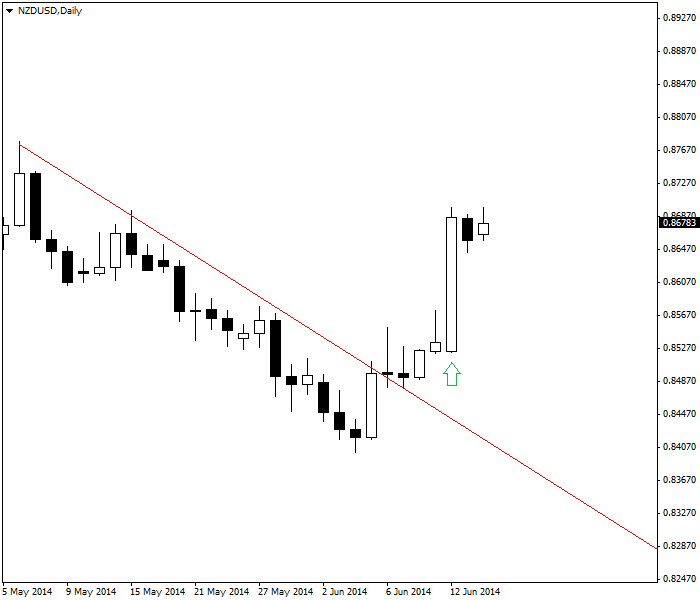 NZD/USD shows a successful breakout due to the interest rate hike (marked with the green arrow). Sometimes a breakout takes place in the absence of any news or detectable change in sentiment. Clearly, some player or group of players had a change of sentiment, but we may not find out what it was until long afterwards. Or some players were trying to drive the price to a level so they could buy more cheaply or sell more dearly. When you are trying to reconcile fundamentals with a breakout on the chart and cannot find reasons, you have to decide whether to obey what you know about the fundamentals or to have faith in the chart. This is a personal decision, but most traders choose to trade the breakout and plan to get out fast in case it fizzles. If you wait until a breakout is confirmed, you will have an opportunity loss since a large portion of the gain comes early in the breakout move. Confirming a breakout can be tricky. Some analysts consider a breakout valid if the move is some minimum percentage change, like 20%. We find such a rule to be not useful. A breakout can be valid at 10% or invalid at 40%. One rule is to consider the breakout not false if a previous high or low is matched-and-surpassed. The USD/CAD chart below shows an upside break of the red resistance line, but then the price fails to make a higher close (topmost gold line). It makes highs higher than the breakout bar’s close, but it does not close higher. This is usually a sign of a failed upside breakout, but in practice you cannot be sure until it makes a lower low after the breakout (next lower gold line). 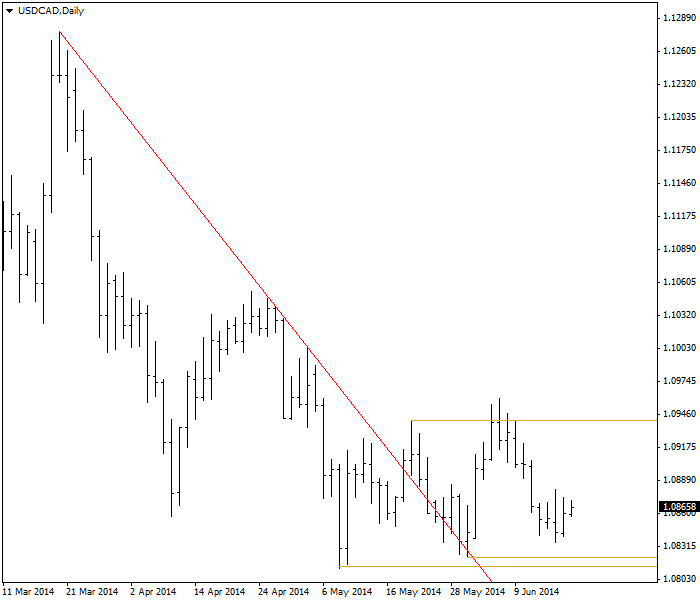 A bigger test of failure is if it makes a low lower than from before the breakout (bottommost gold line). If you are new to technical analysis, breakouts are about to become the bane of your existence because they can be so confusing. Breakouts seem to be fizzling when all that is happening is a large group taking early profit — and then the move resumes. Breakouts go hand-in-hand with pullbacks, and so you need to get a clear idea of both concepts. 2. Breakouts are defined as the penetration of support or resistance. False — you can have the penetration of some other line or a special bar. a move of 20% or more. when a previous high or low is surpassed.